Canadians Bivouacked in the Reserve Lines, Amiens, France, Aug. 1918. With the Germans vulnerable, General Sir Douglas Haig proposed a massive counter-offensive in the Summer of 1918. Canadian and Australian infantry, along with an unprecedented 500 tanks, were to spear-head what was to become the offensive that would end the war. As usual during the First World War, even the most sophisticated attacks used up more men than the defence. In this case, the heaviest losses for the Germans were among their irreplaceable elite troops. By July, offensive opportunities for the British army were beginning to appear. Haig proposed an attack near Amiens using an unprecedented 500 tanks supported by Australian infantry. The Australians agreed on the condition that the Canadians would also take part. The ensuing Battle of Amiens marked the beginning of the end for the Germans. 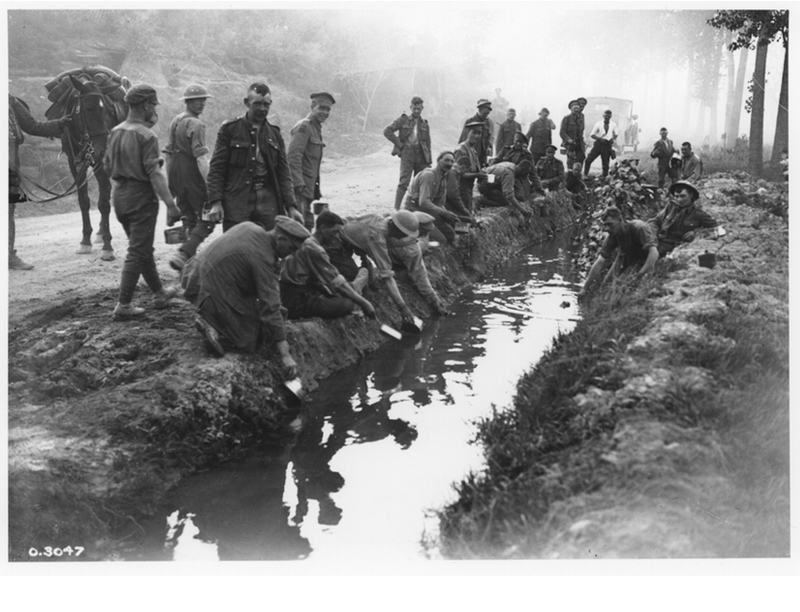 Canadians Filling their Water Bottles, Amiens, France, Aug. 1918. Canadians Digging in Amiens, France, August 1918. 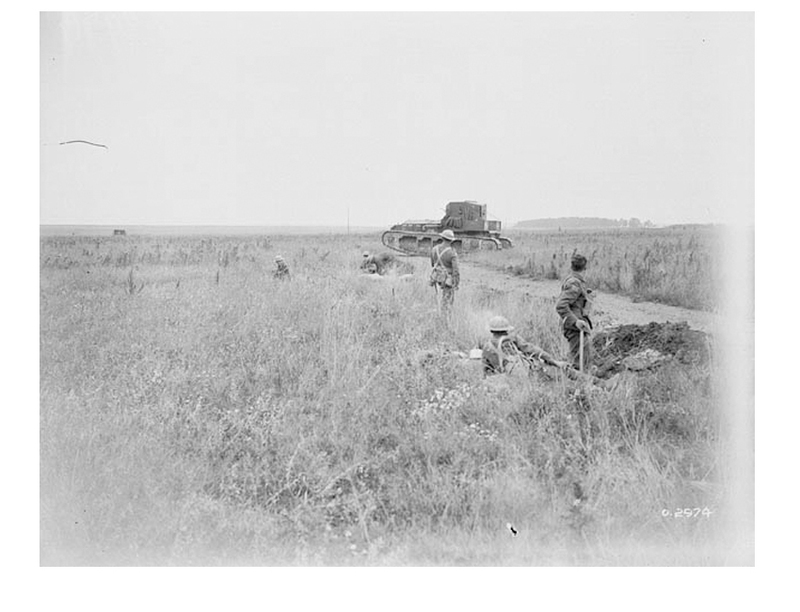 Canadian Tanks Going into Action, Amiens, France, Aug. 1918. German Prisoners Captured by the Canadians, Amiens, France, Aug. 1918. A Canadian Field Ambulance, Amiens, France, Aug. 1918. The Battle of Amiens, 1918. The Battle of Amiens, beginning on 8 August, was the start of the Canada's "Hundred Days," or the offensive action which eventually ended the war. 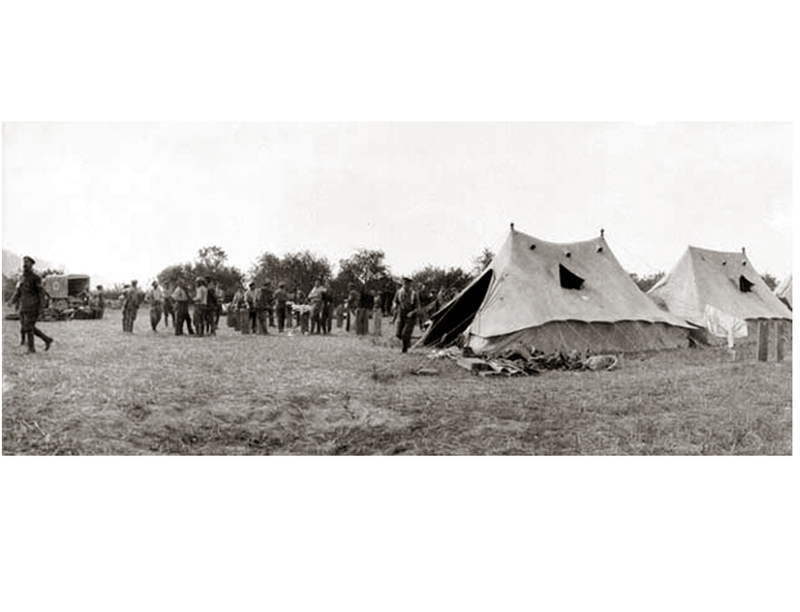 The 49th Battalion played an integral part in the battle along with the rest of the Canadian 3rd Division. The strictest security and the most elaborate deception measures yet used in the war marked the operation. Divisional commanders did not find out about the plans for the attack until a week before and battalion officers not until two days prior to the attack. These precautions were taken in order to avoid tipping off the Germans to the move of the Canadian Corps into attacking position. The 49th, along with the rest of 3rd Division, was on the right of the attack bordering on the French 1st Army. This was expected to be the most difficult part of the attack since the French lacked tanks in large numbers and a small stream, the River Luce, had to be crossed. In the event, the attack on 8 August 1918 went exactly as planned. By 11:00 a.m., the 49th had broken through the first German trench line and advanced to their objective. At a cost of 61 casualties, the battalion had taken 200 prisoners, 20 machines guns, and 11 field guns. The 49th dug in on its objective and watched as masses of cavalry rode by in an effort to exploit the breakthrough. This part did not go according to plan since the few surviving German machine guns were able to bring the horsemen to a halt. NAC (PA-002925, photo by William Rider-Rider). Canadians Advancing, Amiens, France, Aug. 1918. 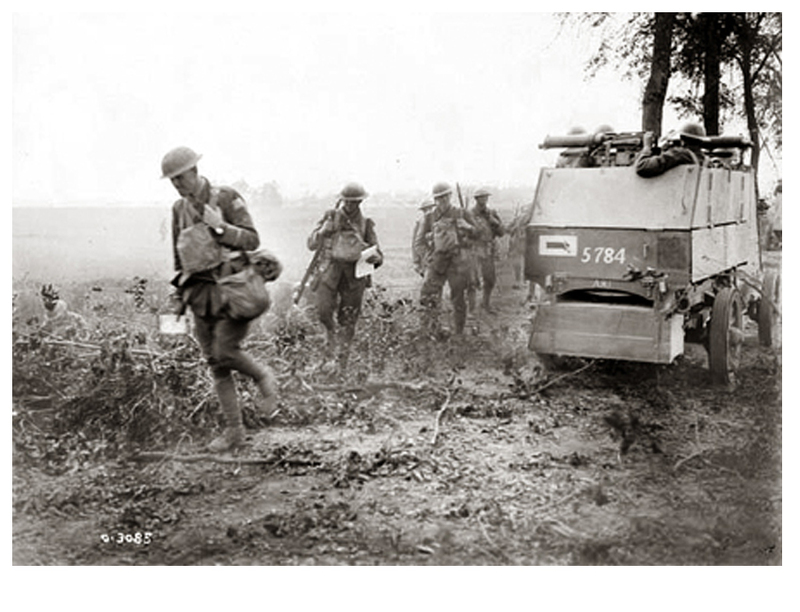 Canadian troops made rapid advances and took on light casualties during the Battle of Amiens 8-18 August 1918. This engagement should have been the end of the battle for the 49th, but, even though the Germans had rushed in five divisions of reinforcements, General Rawlinson decided to push on in hopes of a larger breakthrough. The attackers were now running out of relatively unbroken ground and approaching the old trench lines from 1916. As an incentive to continue the battle, Rawlinson at first offered General Currie a fresh British division, the 32nd, then changed his mind and withdrew it at the last moment. Instead of pulling back into rest, the 3rd Division was ordered to renew the attack. On 13 August, the 7th Brigade captured the village of Parvillers in confused fighting. The casualties were once again relatively light. After a brief rest, the Canadians moved north to take part in the new offensive on the Arras sector, an operation that led to the capture of the formidable Drocourt-Queant line and, ultimately, to the city of Cambrai. The 49th went back into action on 26 August as part of the assault on Monchy-le-Preux. This time the battalion was on the left side of the Canadian line along the River Scarpe. By this stage of the war, the soldiers of the 49th, like the rest of their compatriots in the Canadian Corps, were experienced fighters. According to many military historians, they were as good as the very best on either side. (19) If the artillery did its job and the adjoining units did theirs, then the 49th would achieve its objectives. With a little bit of luck, they would do so with minimum casualties. The Battle of Arras went that way for the 49th. Although other elements of the Canadian Corps, and even of the 3rd Division suffered heavily in the fighting, the 49th was able to capture a trench complex and a fortified village (Pelves) at a cost of 78 casualties. This remarkable photograph shows a Canadian Battalion passing through the German barrage on the Arras Front. Bridging the Canal du Nord, France, Sept. 1918. The Canal du Nord represented a major obstacle to further Allied offensives on the Western Front during the First World War. In the face of intense German resistance, the Canadians managed to cross the canal and push deep into the German defences located on the other side. The next round was not so fortunate for the 49th. At the end of September, the Canadians had to cross the Canal du Nord, an incomplete construction project with sides so steep that ladders had to be used to climb in and out. The Germans had, of course, fortified the far bank with their usual skill. The first part of the attack succeeded brilliantly. The 7th Brigade crossed the canal on 28 September and broke through the Marcoing Line, the main German defensive position, although with heavy casualties. The way appeared open to capture the city of Cambrai, but, as usual in the First World War, the defenders were able to bring in reinforcements quickly and plug the gaps. A railway embankment covering the village of Tilloy provided cover for the Germans, and the battalion was able to take the position only with great difficulty on 29 September. The following day, the 49th, with sergeants commanding companies and corporals leading platoons, held the embankment while the Patricias pushed on to capture Tilloy. By the end of that day, the brigade was completely exhausted and pulled back to rest. The vicious fighting from the Canal du Nord to Cambrai cost the 49th almost half its strength, 308 casualties. The Forty-Niner, 1:15 (July 1932). "D" Company Corporals, Mons, Belgium, 14 November 1918. Like other Battalion companies members, the soldiers of "D" company of the 49th Battalion were enormously relieved upon hearing that a truce with the Germans had been achieved on 11 November 1918. 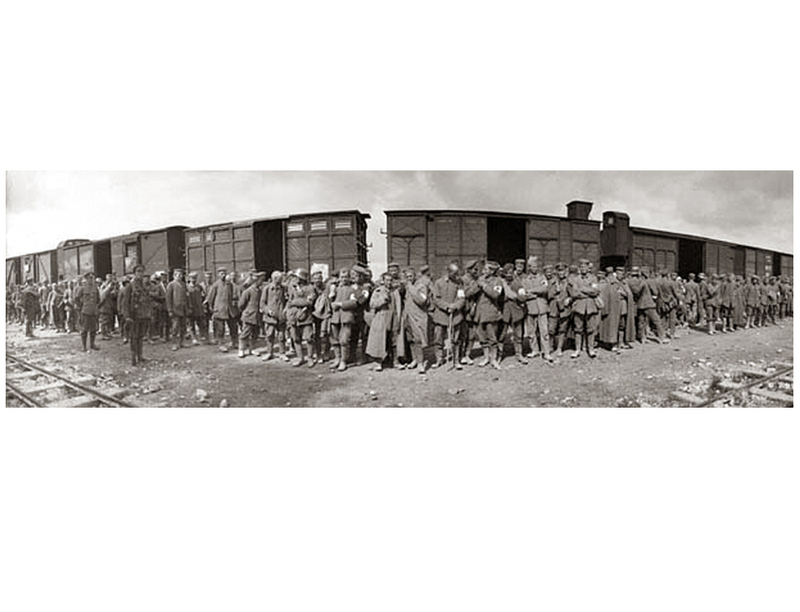 By October of 1918, the German army was nearing the end of its strength. As the battles of September showed, it was still capable of hard and skilful fighting, but the losses it had suffered at Amiens and Cambrai, as well as the rapidly increasing numbers of Americans arriving in France, convinced the German military leaders, Generals Paul von Hindenburg and Erich Ludendorff, that no prospect of victory remained. After Cambrai, the German army conducted a fighting retreat while peace negotiations proceeded. For the 49th, the last few days of the war were spent cautiously advancing against scattered German opposition across the French border toward the Belgian city of Mons. They were entering the outskirts of Mons on 11 November when news of the armistice arrived and the fighting stopped. The celebrations were modest, the survivors felt relief rather than jubilation. Slightly more than 4,000 men had served in the 49th in the three and a half years since the battalion arrived in France. Among this total, 973 had died and 2,282 were wounded, a casualty rate of 81 per cent. This bugle was the one used to signal that a cease-fire between the German and Allied forces on the Western Front had been achieved. The inscription refers to the time -- the eleventh hour of the eleventh hour of the eleventh month -- at which the bugle was sounded to signal the end of the First World War. 19. See especially Shane B. Schreiber, Shock Army of the British Empire (Westport, CT: Praeger, 1997).